Serenbe Designer Showhouses have featured Swann Ridge, Grange and even the Mado neighborhood, and this year the Atlanta Homes & Lifestyles Showhouse will be in the place where Serenbe began – Selborne. Master Bedroom, Designed by Gretchen Edwards, Gilstrap Edwards Interior Design. Photo by Stevie Seay. Designed by L. Mitchell Ginn and built by McKinney Builders, the Selborne Estate Home is a modern take on the classic farmhouse cottage with board and batten siding, a metal roof and stone terrace and chimney. The Selborne Estate Home features 12 of Atlanta’s best interior designers; including Meredith McBrearty, Anna-Wooten Loggins, Melissa Galt, Janie Hirsch, Anna-Louise Wolfe, Gretchen Edwards, Buffy Ferguson and David Frazier, Julie Holloway, Kate Light, Rebecca Cartwright, Robin Lamonte and Stefan Alexander; whose talents will transform almost 5,000 sq.ft. of indoor and outdoor space (enjoy some sneak peeks in this post!). Meredith McBrearty is the lead designer on the project and made all selections for the finishes, as well as collaborating with Bell Cabinetry to design the kitchen. 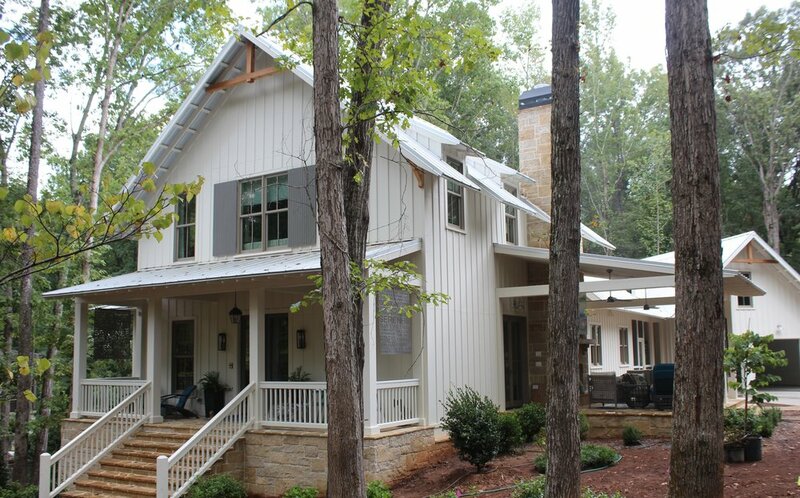 The 2018 Atlanta Homes & Lifestyles Serenbe Designer Showhouse is only around for a short time, don't miss out on touring this modern farmhouse before some lucky homeowners make it their own. The house is already a hit with the press and has been featured in The Columbusite, ADAC Atlanta, Atlanta Magazine, Business of Home and more. Office/Craft Room, Designed by Robin Lamonte of Rooms Revamped Interior Design. Photo by Stevie Seay. Foyer & Stairway, Designed by Anna-Wooten Loggins of A. Wooten Interiors. Photo by Stevie Seay. Tours of the Designer Showhouse are available four days a week, September 14-October 7, Thursday-Sunday, 10am-5pm. You can also book a tour for your group of 10+ guests Tuesday-Wednesday. Tickets, $20, are available online HERE or at the door. Private group tours should be reserved in advance by contacting showhouse@serenbe.com.